1. The Golden Joystick Awards 2018 voting goes live - but can Gorgora, Dead Cells and Subnautica steal the spotlight from big hitters such as God of War? 33 years of Golden Joystick Awards winners - how many can you remember? 2. Will Fortnite sixth season put it back on track? Let’s be honest, Fortnite isn’t going anywhere anytime soon but it’s fair to say that its fifth season didn’t have the rocket bangs and Infinity stone whistles of the fourth. In fact, not a lot really happened. We’ve had the giant cube slowly rolling around the map that, as of now, has sunk into Loot Lake, and you can bet some v-bucks that's not the end of it. But compared to the environmental storytelling and stories hidden within the blockbuster loading screens we’ve seen before it’s felt a bit empty... Seriously though please bet me some v-bucks. I spent all my bread and sweets money on that stupid dragon glider. 3. Can This Is Us score a perfect hat trick with its third season of dysfunctional fam-drams? Spoilers - What’s acceptable, and what definitely isn’t ok? 5. South Park Season 22 premieres on September 26 - but is the show going to be cancelled? Fans of episodic narrative adventures with relatable characters and knotty moral choices… rejoice! The full Life is Strange sequel starts at the end of the month with, we assume, episode 1. However, if you can’t wait that long (who can?) don’t forget that you can still download The Awesome Adventures of Captain Spirit, for free, and play a good 2-3 hour prequel to LIS2 right now. What’s more, the decisions you make as young Chris Eriksen in Captain Spirit will actually impact the way Life is Strange 2 plays out, even though the lead characters are different. In LIS you’ll assume the role of Sean Diaz, a young fugitive, although we do know he’ll cross paths with Chris at some point (the reveal trailer shows the characters are in the same part of the US). So, yes, brace yourself for more Life is Strange, but also make sure you’ve played the freebie prequel too. Because it’s free. 8. Can Tokyo Game Show deliver any E3 size reveals? For gamers in the UK and US, the hype calendar is built firmly around the gaming trade show E3, which takes over LA in June, but you shouldn't discount the Tokyo Game Show, which is happening right now. Japan is, after all, the heartland of video games and home to Sony, Nintendo and Capcom, to name just a few. We're expecting to see new footage from Death Stranding, Kingdom Hearts 3, Sekiro: Shadows Die Twice as well as a bunch of new announcements. Get Google Translate ready, stuff a value bag of popcorn in the microwave and settle in for a weekend of new trailers and teases. 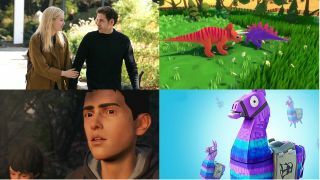 8 things to watch out for this week picks the best games, movies, and shows of the next seven days every Friday at 9am PDT / 5pm BST.